Are you interested in learning how does geothermal energy work? Clean and renewable, this type of energy utilizes the earth's heat to generate steam which ultimately becomes electricity. Geothermal energy used for electricity generation is always an industrial scale operation. If you live or work in an area where the power company utilizes geothermal energy, then that is how your home or office is powered. At the most basic level, geothermal energy converts thermal energy to electricity. At a geothermal energy plant, drilling must take place to access hot rocks below the earth's surface. The heat from the rocks is used to covert liquid to steam. The steam is used to turn turbines which are connected by a shaft to a generator, which converts the rotational energy into electrical energy. Geothermal energy plants utilize either an open loop or closed loop system to harness geothermal energy so that it can be used for electricity. With this type of system, water is pumped down to hot rocks deep in the earth's crust through a pipe. Underground, the water leaves the pipe, where heat from the rocks boils it into steam. The steam travels through cracks in the rocks and goes back to the surface through pipe which is connected to a turbine. After the steam hits the turbine, it is released into the atmosphere. While this is the least expensive type of geothermal energy system, it is not generally considered to be the best option. By the time the steam reaches the turbines it has picked up bits of dirt, clay, and sediment which abrade the turbine blades. Additionally, because the steam is released into the atmosphere, new liquid must continually be pumped into the ground. The primary difference between a closed loop and an open loop system is that the steam remains enclosed in pipes through the entire process. Water, or a liquid with a lower boiling point than water (such as ammonia), is piped to hot rocks beneath the surface of the earth where it is converted to steam. The steam is not released to naturally rise to the surface, as it would be in an open loop. It travels to turn the turbine through a pipe, so it is not exposed to pollutants. Instead of being released into the atmosphere, the steam is condensed back into a liquid and pumped back underground for reheating. The reason this method is referred to as a closed loop is because the water never leaves the pipe. During the process, it is converted from a liquid to a gaseous state and then back, but it is always enclosed in the pipes so it stays pure. Instead of being released into the atmosphere, it is re-used. Closed loop systems are viable in any location where it is possible to access rocks that are hot enough to convert liquid to steam via drilling. With geothermal energy, there is minimal environmental impact because no greenhouse gases are emitted. Even though this fact makes this type of energy very desirable, it is not widely used because it is simply not feasible in many locations. The closer you get to the earth's mantle, or the deeper you get in the crust, the hotter the rocks get. If it were possible to drill deep enough, theoretically geothermal energy could be used anywhere. Unfortunately, because of drilling limitations, geothermal energy it is practical only where there is hot rock very close to the surface. Places where there is active volcanic activity can be well served by using geothermal energy because there are hot rocks very close to the surface. Additionally, areas where there are geysers or hot springs are likely to be good locations to harness thermal energy for practical purposes. 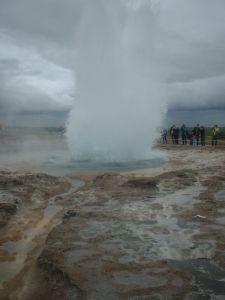 Iceland, which is highly volcanic, is the world's biggest user of geothermal energy.